Did you participate in a sprint planning meeting before to start a new sprint? Actually all the meetings do not provide a roadmap for the team if they are not assembled in an efficient way. However the aim of this meeting is to help the team to create a good work. 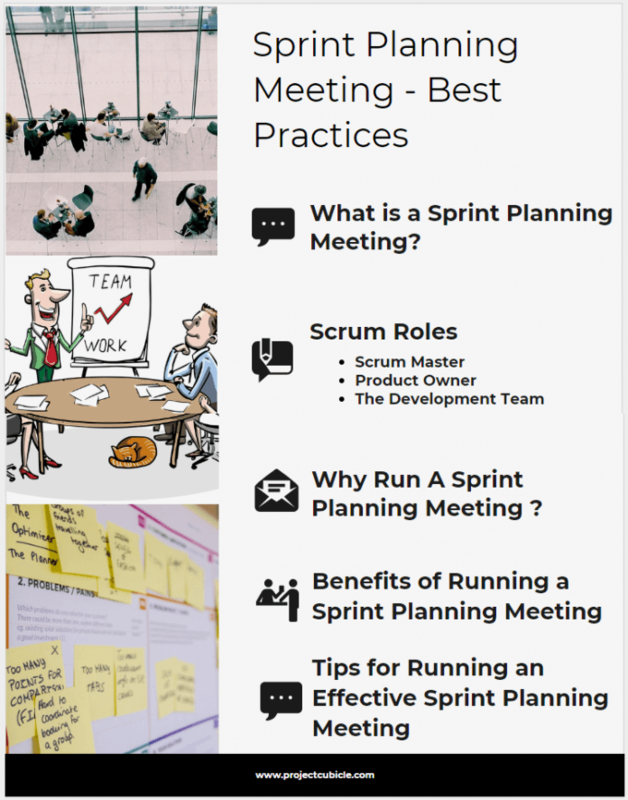 In this article we will discuss the key aspects of this important meeting and provide some tips to improve the efficiency of your next agile sprint planning meeting. After reading this article, you will gain more knowledge on the subject. Before to start, let’s discuss the definition of the sprint planning meeting. Sprint planning meeting is one of the most important scrum ceremonies to achieve the agile implementation within an organization. Therefore implementing agile and planning successful meetings require skilled and experienced team members. It is a kick off meeting for each sprint to assembled to answer the questions, What will be delivered in this next sprint? How will we deliver ? Simply put, scrum master and the entire scrum team discuss structure, set expectations, and define the backlog for the next sprint by answering these questions in a sprint planning meeting. During a sprint planning meeting the product owner describes the priorities for the product and the scrum team asks questions to understand the key aspects. It is a collaborative meeting in which the product owner, the scrum team and in some cases outside stakeholders may attend in. Agreement by the team to do what is possible to achieve the goals. For better understanding let’s discuss each role in a scrum team. Agile is a project management methodology which is applicable to almost every industry projects form software development to manufacturing. Many people think that scrum is a methodology like agile. However this is not true. Scrum is one of the most applicable framework to implement agile which allows team members to resolve complex adaptive problems while delivering products. Basically, Scrum roles are differ from the traditional project management roles. There are 3 major scrum roles which are the product owner, the scrum master and the development team. Scrum master is a person who guides the project team and makes sure that the process is following the scrum framework. He or she improves the productivity of the team by removing the obstacles and organizing the critical meetings. From this aspect he acts as a protector which makes the process run smootly. From the sprint planning meeting point of view, he/she facilitates the meeeting and ensures that members are prepared and every participant is available at the scheduled time. The product owner is the one who is responsible for expressing the product backlog items to the team members. His/Her aim is to maximize the value of the product. In other words, one of the main responsibilities of a product owner is to order and prioritize the Product Backlog items to goals and missions. The product owner should be well prepared before the sprint planning meeting in terms of creating the product backlog items. Because he/she will anser the questions of the team around product requirements such as acceptance criteria. The developmen team is a group of experts (designers, developers, testers, etc.) who will do the actual work or contribute to the product. The product owner sets product backlog items, the scrum master guides the team to follow the scrum framework and the development team performs the work. What is expected from the development team in a sprint planning meeting ? Why Run A Sprint Planning Meeting ? Working as an organized team often brings success than woring as unorganized individuals. This meeting provides a great opportunity to get the scrum team together and remind the responsibility of each participant over the next sprint. Without a meeting, it is difficult to understand what exactly team members are working on and who is responsible on what. If the meeting is assembled correctly, you will get a chance to improve the efficiency of the team. Create a Meeting Agenda to save time. Remind the goals, or visions of the project to the team members. Keep the length of the meeting optimum. Every project manager knows some practices and methodologies. In other words, project management is on the mind of every manager. However agile is an iterative methodology for planning and guiding the project process which is applicable to almost every industry projects. As we mentioned above, Scrum is one of the most applicable framework to implement agile. Basically, running a sprint planning meeting and implementing Agile Methodology is not difficult. However, they require experience and practices for a successfull implementation. You can share your knowledge and experiences which others can benefit through the comments box below. Previous articleHow to Become a Project Manager ?